Helen Bannerman. LITTLE BLACK SAMBO. Grant Richards, London, 1899. The fourth Dumpy book. Dumpy books were still going until recently but this is by far the most valuable. Only 500 were printed. Written during the author’s journey to India. Her intention was to present the tale and its charming pictures to her children, who had remained at a Hill Station while she travelled with her husband- an army doctor. It was an immediate hit with them and a friend took it the next year to Grant Richards who bought the copyright for £5, something of a bargain. Its success is partly due to the attractive and innovative format, and also its vivid no nonsense 27 colour illustrations. Although often accused of racism ( the title doesn't help) it was something of a break from former stories featuring black children in that it portrayed the character as clever and resourceful rather than an impassive simpleton as so often before. Endless editions have appeared with different illustrators, moveables, pop ups, cut outs, miniatures, parodies and paint by number jobs. VALUE? Fairly vulnerable little book with Victorian gutta percha binding so that the spine often needs replacing or strengthening. Also it tends to have been read, handled and chucked about by young children, who along along with 'fire, water, librarians and servants' must be numbered among the enemies of books. Fine copies are highly prized, 2 decent copies on ABE in late 06 at over $10K with the highest at a slightly stroppy but not absurd $15,500. In Feb 2007 another one has appeared with 2 others in so-so condition. Bit of an ebay favourite where even late reprints are fought for in mortal combat. In terrestrial auctions a decent copy hit $12000 in 1996 and several have breasted $6500. The US 1901 ed from Stokes is not be sneezed at, occasionally commanding over $1000. In terms of scarcity the net has revealed it as being difficult but not impossible; the toppermost dealer in this subject Justin Schiller wrote: "Should a census eventually be attempted, there would probably be fewer copies located than of the notoriously rare and suppressed 1865 Alice." Thankee. I got this 500 from a distinguished bookseller's catalogue, he obviously hadn't read Miss Barton's Bib -Barton, Phyllis. Pictus Orbis Sambo: A Publishing History, Checklist and Price Guide. Pictus Orbis Press, (1999). The 6000 run makes Schiller's assertion seem odd. hello,could you help me if possible? 1954 reprint chatto and windus with dust jacket price 4/- a little bit wonky but intact, a small cut of the corner on back jacket fly leaf but no information missing no ISBN number. Little Black Quibba 1973 isbn 0701100273 intact but paper peeled from spine. Would these books have a worth because of the high demand of the originals, these books are also attractive in their own right. I have the same book as in the photo except it is a Fifth Edition, printed in 1901. In excellent condition, no tears on cover. What is the value of this? there will be a first edition for sale at tooveys auction on may 18th 2010. I have Helen Bannerman Little Black Sambo Book. It was given as a gift to a relative in 1914. Fredrick A Stokes Company Publishers. It is interesting than many of the pages are blank. It appears to be designed that way. How would I go about finding its value? 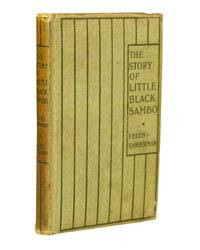 I have a small Little Black Sambo book. It measure 2-1/2" X 3" No author or date. Has black boy on front carry a umbrella over his right shoulder and is walking on beach with palm tree in back ground. Cant find any info on the internet.